Valve actuator 24 VAC 50/60 Hz, 5Nm, 70 sek. 1,5-3,5 W, LK Armatur 950. We don't sell the LK Armatur products to outside of Estonia! LK 950 is a series of valve actuators. Depending on model the actuator can be operated by a controller with a 3-point SPDT output or a proportional 2 (0) - 10 V output. The actuator is fitted with limit switches. The angle of rotation is electrically limited to 90°. 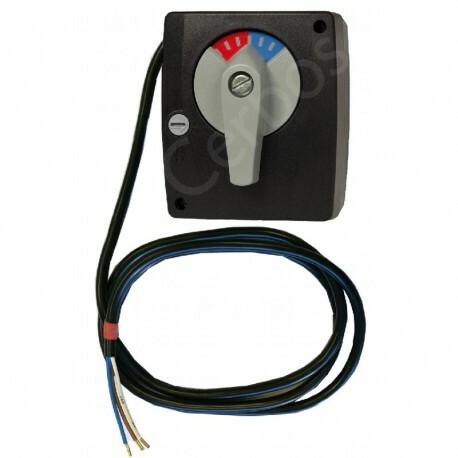 An additional auxiliary adjustable switch can be ordered as an accessory. The actuator can be mounted in any position except below the valve. The actuator is mounted directly onto the valve spindle with a screw. 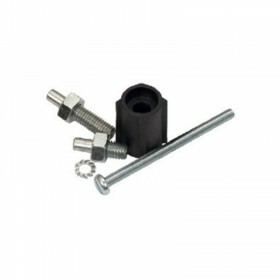 An anti-rotation bolt keeps the actuator in position. When needed, the actuator can be put into manual mode by turning the button on the housing cover 90° clockwise to disengage the gears. The actuator can now be put in any position by turning the handle on the front. The position is indicated on the reversible scale. There are currently two designs of LK 950. However, the function is the same.